First Chapter ~ First Paragraph Tuesday Intros, hosted by Diane at Bibliophile by the Sea, where bloggers post the first paragraph(s) of a book they are currently reading or planning to read sometime soon. 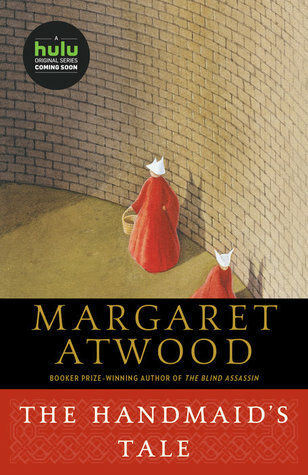 Today I'm featuring an upcoming read, The Handmaid's Tale by Margaret Atwood, which is the selection of one of my book clubs. The excerpt comes from a trade paperback version borrowed from the library. We slept in what had once been the gymnasium. The floor was of varnished wood, with stripes and circles painted on it, for the games that were formerly played there; the hoops for the basketball nets were still in place, though the nets were gone. A balcony ran around the room, for the spectators, and I thought I could smell, faintly like an afterimage, the pungent scent of sweat, shot through with the sweet taint of chewing gum and perfume from the watching girls, felt-skirted as I knew from pictures, later in miniskirts, then pants, then in one earring, spiky green-streaked hair. Dances would have been held there; the music lingered, a palimpsest of unheard sound, style upon style, an undercurrent of drums, a forlorn wail, garlands made of tissue-paper flowers, cardboard devils, a revolving hall of mirrors, powdering the dancers with a snow of light. After all the fanfare about the recent television adaptation, I am eager to get started on this novel. The very descriptive first paragraph brought back images and memories of my own high school gym. This First Chapter ~ First Paragraph post was originally composed and/or compiled and published by Catherine for bookclublibrarian.com. It cannot be republished without attribution. Retweeting and sharing on Google+ are appreciated.